Gemstones and jewelry have long been prized by humanity for their beauty and value. And with the most famous diamonds and gemstones, it comes as no surprise that large bodies of lore develop around them. Today we present a selection of the most notorious haunted gemstones. 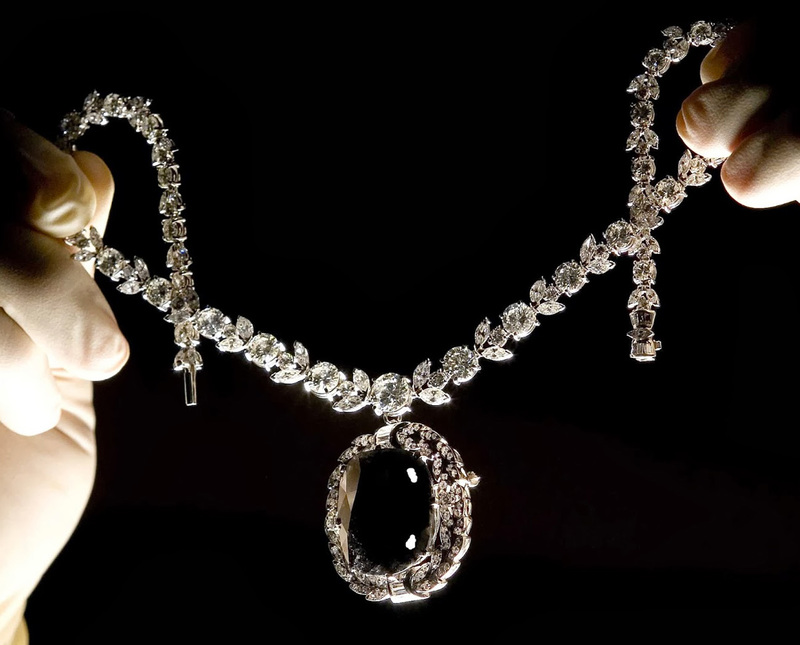 Each jewel on this list has developed a reputation for being cursed, ultimately bringing down the worst of fate upon the owner. Whether these tales of haunted gemstones ultimately hold true, we leave that to your speculation, dear reader. Named for the Hope family, who owned the diamond in the mid 19th century. Believed to have originated from the Kollur Mine of India in the 17th century. 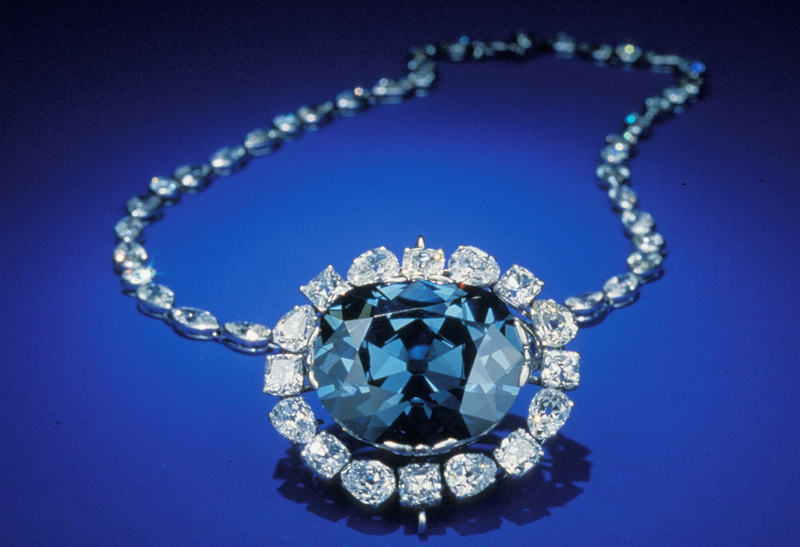 Without a doubt, the Hope Diamond is the most famous diamond in the world. We’re willing to bet it’s also the most famous gemstone of them all, for that matter. With that said, it probably comes as no surprise that it tops our list. A rare blue diamond, the provenance of this stone can be traced back for centuries. And with a gem so old, it comes as no surprise that there is something of a dark side to it. Some say the story of a curse is to fabricate interest in the stone. Others prefer to indulge the mystery and appreciate the darkness surrounding the diamond. Many lurid tales surround the diamond’s trade over the years. A string of deaths reputedly follow it, and it has often been noted how owners of the stone would meet grisly or unfortunate ends. Several of these stories have been shown to be fabrications, while others may contain an element of veracity. However, without any independent confirmation to back up these tales, these stories remain inconclusive at best. Also, it’s been noted many times over the years that the stone’s value would significantly increase each time a new account of its troubled history surfaced. Despite its storied history, the Smithsonian, where the diamond currently resides, has benefited enormously. Its fascinating history and spectacular beauty have long been a draw among its incredible collection of gemstones and jewelry. Named by Nader Shah, ruler of Persia, in the mid-18th century. Believed to have originated from the Kollur Mine of India in the 13th century. Otherwise known as the “Mountain of Light,” the Koh-i-Noor is a massive diamond. 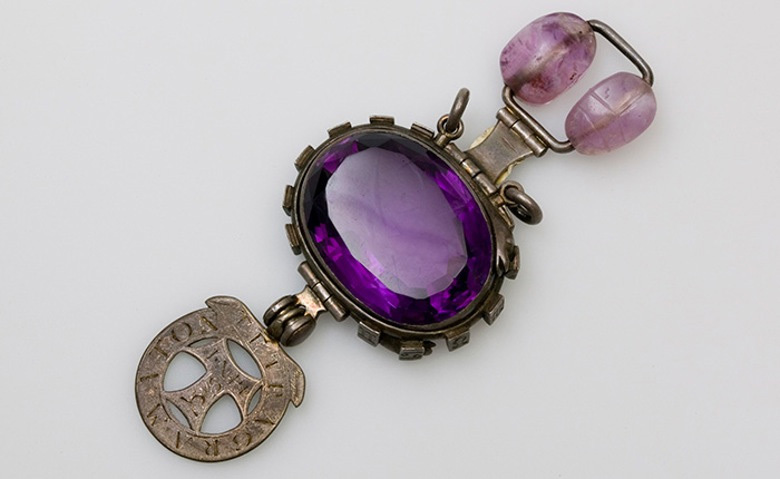 As with many precious objects, ownership has changed hands many times through the centuries. The desire to own this precious stone has led to bloodshed and wars, intrigue and deception. Some sources trace the history of the jewel back to 3000 BC. Others place it coming from the Golconda mines in the 1650’s. Both sources agree that the stone is of Indian origin. And since then, various warlords and rulers in Asia have fought for control. Eventually, the Persian ruler Nader Shah came to possess the Koh-i-Noor, bestowing its current name in 1739. Eventually, it would be the British who came to own the diamond and begin the association of misfortune to the stone. 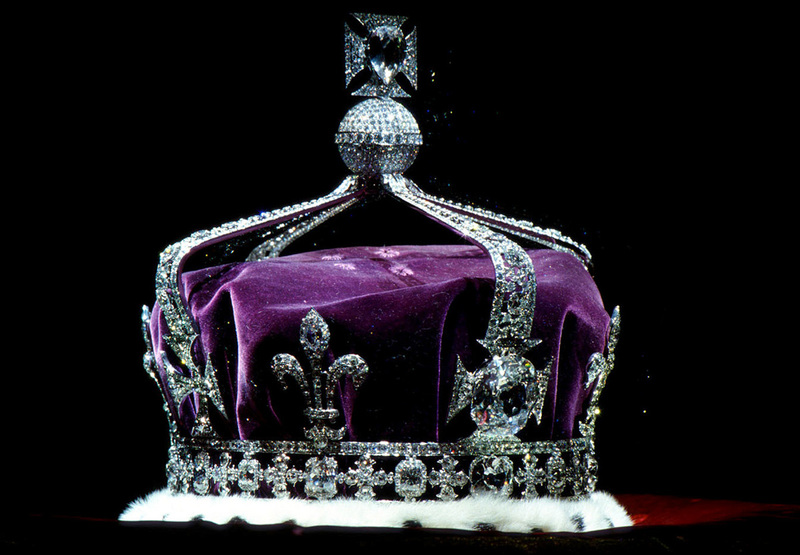 The British royal family incorporated the stone into their crown jewels in 1849. As the Koh-i-Noor had developed a strong history of betrayal and bloodletting behind it, it was thought to be a symbol of bad luck to any man who wore it. For this reason, only female members of the royal family ever wear it. The name is likely influenced by the short story, “The Purple Sapphire,” by Edward Heron-Allen. Measures 3.5 x 2.5 cm, according to the Natural History Museum of London. Unlike many of the other cursed gems in this article, the story of the Delhi Purple Sapphire has somewhat more humble origins. The tale of woe that surrounds the gem was lost to history until a chance encounter took place. In the mid-70’s a curator at London’s Natural History Museum was inspecting a cabinet of minerals. Alongside the stone, they found a mysterious typewritten note, detailing the accursed fortune this gemstone wrought. According to this missive, the stone was plundered from an Indian temple dedicated to Indra during the Indian Mutiny of 1857. Indra is a Hindu deity that overseas both weather and war. Despite this, a cavalry officer, Colonel W. Ferris, looted this gem from Indra’s temple. Upon his return to England, Ferris met with terrible misfortune. First Ferris, then his son, both made several bad investments that nearly bankrupt their family. In addition, the health of both men failed. A family friend is also said to have taken their lives while in possession of the jewel. The next victim of the alleged curse was Edward Heron-Allen, an established author, and a man of learning and reason. Receiving the stone in 1890, it would seem that he immediately ran into difficulties. His experiences, despite his background, quickly led him to believe the gemstone was cursed. Heron-Allen attempted to rid himself of the stone multiple times. However, each and every attempt saw the Delhi Purple Sapphire returned to him. The last straw came in 1904. With the birth of his daughter, he had the stone sent to his banker, with explicit instructions. The stone was to be locked away until his death, and his daughter was never to set hands upon it. He willed it to be donated to the Natural History Museum of London. After his death in 1943, his wish was granted. Unfortunately, this was not the last humanity would see of the curse. In recent memory, John Whittaker, a member of the museum, was entrusted to deliver the gem to an event in 2004. While traveling, he and his wife were beset by a terrible thunderstorm. He described it as one of the worst experiences of his life. This was not the end of things for Mr. Whittaker, either. While traveling with the gemstone a second time, he was struck with incredible pain. Later, this was revealed to be a kidney stone. Named for Princess Nadia Vygin-Orlov, the last owner who died tragically after owning the stone. Believed to have originated from India in the early 19th century. At least three tragic suicides are linked to the Black Orlov diamond. As with many haunted gemstones, tales surrounding the Black Orlov suggest that it began life in an Indian temple. Reputedly, this stone served as one of the eyes in a depiction of Brahma, a Hindu god of creation. Legend suggests that a monk eventually absconded with the stone, leading to it becoming cursed. In the early 1930’s a gem dealer named J.W. Paris acquired the stone. He came to New York seeking a buyer for the incredible gem. Within a week of selling the stone, the troubled man had taken his life. He leaped from a skyscraper in Manhattan, immortalizing himself as the first victim of the diamond. About 15 years later, the Black Orlov is said to have taken its second life. Princess Leonila Viktorovna-Bariatinsky was the stone’s second victim. After coming into possession of the stone in 1947, it was found that she committed suicide by jumping to her death. Unfortunately, details of her life before her tragic death are unavailable. The diamond had found a new owner with Princess Nadia Vygin-Orlov of Russia. Sadly, Princess Nadia also met her end by suicide. She leaped to her death in 1947, approximately one month after the death of Princess Viktorovna-Bariatinsky. Notably, the Black Orlov received its namesake after her unfortunate death. In an effort to finally break the diamond’s curse, Charles F. Wilson, the gem’s new owner, had the stone recut in the 1950’s. Over the course of the next two years, the Black Orlov was cut into three new stones. One continued to bear the name Black Orlov, and not further developments have occurred since. Elizabeth Taylor favorite gem La Peregrina pearl is one of the largest found pearls in the world. Discovered in the Gulf of Panama during the 16th century. Found by an African slave, the Spanish translation of La Peregrina means the “Pilgrim” or “the Wanderer” and it certainly was. La Peregrina was passed on to the royal families when it traveled to England, an enemy of the Spanish at this time. King Philip II of Spain presented the pearl to Queen Mary I of England before their marriage in 1554. But later abandoned her and the Queen died in 1558 without an heir. She was nicknamed “Bloody Mary” after her death because of the hundreds of Protestants she ordered to be executed during her five-year reign. Following the queen’s death, La Peregrina pearl was returned to King Philip II, who then proposed to Mary I’s younger half-sister, Elizabeth I. The pearl was worn by Spanish royalty until the 19th century when Napoleon Bonaparte invaded and the French seized the Spanish crown and the pearl. The La Peregrina pearl had found a new owner of the Bonaparte family but was ultimately sold to Lord James Hamilton in 1873. It was later sold at a Sotheby’s auction in 1969 to Richard Burton, who gave it to his wife, Elizabeth Taylor, as Valentine’s Day present. The couple married and divorced twice with their second marriage lasting only nine months. Elizabeth Taylor held on to the pearl and married a total of eight times. After Elizabeth Taylor’s death in March 2011, the pearl was sold at a Christie’s auction in December 2011 for a record $11.8 million. Amber is believed to offer a magical light for the dead as they progress through the underworld. This stone may appease the ghosts who visit you on Halloween and help them to find their way back! Ruby reflects a deep blood red similar to what runs in the veins. Fiery and romantic, the red hue of ruby shows brilliant depth and intensity and is certain to draw attention. Citrine is used as a protective talisman against evil thoughts. Keep it one handy if you’re feeling wicked. Spinel can be used to identify those who possess supernatural powers. Such people will shake uncontrollably when approached with a hidden spinel gemstone. Moonstones hold a hazy, milky, and intriguing translucence. The ghostly, ever-shifting play of light and shadow within its depths reveal a cryptic luster. Moonstone radiates like the ever glow of moonlight and what’s more spooky than a full moon on Halloween night? What do you love about Halloween? Are there any gemstones that fly off the shelves this time of year? Share your thoughts in the comments below.